Discover the best shopping places in Prenzlauer Berg including handmade kilim and unique gifts as well as where to get the best ice cream. 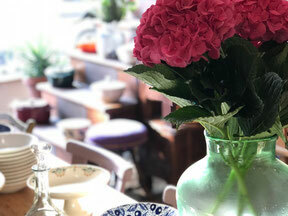 I hope you enjoy my top 5 shops in Prenzlauer Berg. If you want to see more of Prenzlauer Berg and Berlin in general, you could also take a stroll on three recommended walks on the Prenzlauer Berg map BertaBerlin. 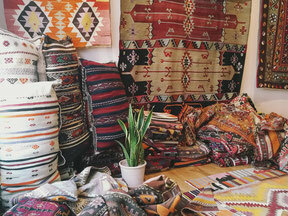 This interior shop sells beautiful handmade vintage kilims, and invites you to stay and drink a tea or two. It embraces the beauty of the Turkic nomad tribes. Their selection of carefully curated handwoven vintage kilim-rugs, traditional textiles, calligraphy and ebru art will guaranteed bring a bit of Turkey to your home. There are things in this shop you won’t find anywhere else. Prototypes, unique gifts, crazy inventions and good ideas for any occasion. Just have a look. This charming vintage boutique feels like a mother’s wardrobe, and you’ll find some designer gems such as Acne or Chloe. Worth checking out! 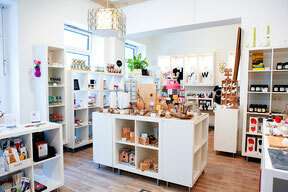 BertaBerlin Prenzlauer Berg and the BeautyBerlin map will be available at this shop ;). This ice cream patisserie sells splendid ice cream made by a professional patissier. 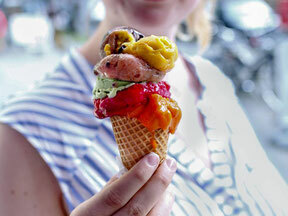 Prenzlauer Berg’s ice cream shop presents various ice creams behind an arched glass. Try their name-giving flavor of the store! 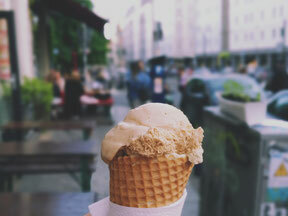 Natural artisanal ice cream is conquering Berlin - and the lovely Polish couple behind OAK&ICE make pure, handcrafted flavors to die for. Intense fruity sorbets and seasonal specials like dark chocolate will make you salivate on sight. No matter the time of the year, this place is always a good idea. Did we mention it’s also vegan friendly?